New Solo CD, the second for our label after the successful Scented Maiden (2011), by the Chinese erhu (two stringed violin) virtuoso Guo Gan. In this new recording GUO GAN presents 11 compositions, 2 classics including Horse Race, his trademark here presented in a very original version, and 9 pieces he composed for this occasion. In this new recording Guo Gan takes the full responsibility appearing not only in the role of interpreter but also composing, in the traditional style, the music here presented. New Solo CD, the second for our label after the successful Scented Maiden (2011), by the Chinese erhu (two stringed violin) virtuoso GUO GAN. In this new recording the Chinese virtuoso presents 11 compositions, 2 classics and 9 pieces he composed for this occasion. Often described as the Chinese ‘violin’, the erhu belongs to the fiddle family, that is to say lute family - for the shape - but whose strings are made to vibrate with a bow. 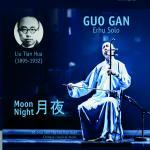 The two classical pieces from the repertoire of erhu that GUO GAN plays are two masterpieces: Saima, Horse race inspired by a folk melody, his trademark here presented in a very original version, and Reflections of the moon inspired by the mood of the landscape, The other tracks, nine, are all original compositions inspired by his Chinese experiences: by the millenarian culture (Shadow Puppets, Beijing Opera, Go, The Lantern Festival), by important moments of the China’s history (The Forbidden City) or personal experiences (Water Women, Tea-girl) to underline, if necessary, the deep and strong roots GUO GAN maintain with his homeland even now that has become a citizen of the world with concert tours that take him to all the four corners of the planet. GUO GAN started learning erhu in early childhood from his father Guo Jun Ming, also a renowned erhu virtuoso. In 2000, he moved to France to study, and later obtained his Master's degree from the National Music School of Fresnes in Paris. During this period, he founded the first Chinese Jazz band - Dragon Jazz - in Paris and won the second place at the European Chinese musician competition in Belgium in December 2002. Through Chinese traditional erhu art, GUO GAN worked with many musicians and artists in different parts of the world and travelled to more than 70 countries. He played in nearly 2000 concerts and appeared in more than 40 albums. He performed at many famous concert halls of the world such as the Carnegie Hall and Lincoln Hall in New York, the Chicago Symphony Hall, the Royal Music Hall in Geneva, the Paris City Hall, the Palais des Congrès and many others. Guo Gan played with many of the world's most famous musicians, including Lang Lang, Yvan Cassar, Didier Lockwood and Jean-François Zygel. His performances with Lang Lang in Europe and the US have not only been highly recognised and praised by the media, but also gained him popularity among music lovers around the world. He performed with world's top orchestras as well. He was also involved in different areas of music such as world music, classical music, jazz, ballet, opera, modern music, film music and pop music. He was highly recognised by the media. Television and radio stations conducted personal interviews with GUO GAN referring to him as the master of two strings. In the eyes of the French media, he became a symbol of the Chinese erhu. in "Fischia il vento - Canti e musiche della Resistenza in Liguria"